The STI gap-ed down today to no surprise given the resistance it has met once again with the 3000 level and simmering investors' appetite since the rally began 2 months ago. Again, commodities and shipping counters were especially battered today in light of their poor fortunes with China slowing down and the overall trade malaise. Olam is a global agri-commodity brand that has strong roots in the African region. Temasek has a strong investment presence in this company as one of their strategic plays on the commodities business. It has however been battered and wrung dry lately in light of the global commodities sell-down. Its price recovered slightly given some injection of market confidence through an aggressive share buyback and show of confidence in the business by the upper management in buying up shares. Outlook - Go on short. Even with an aggressive share buyback programme and show of strength with its management buying up shares as well, the market has clearly not bought the story that there is still upside and maintained profitability at least in the remaining half of the year. Huge black candlestick today with high volume. Sell. 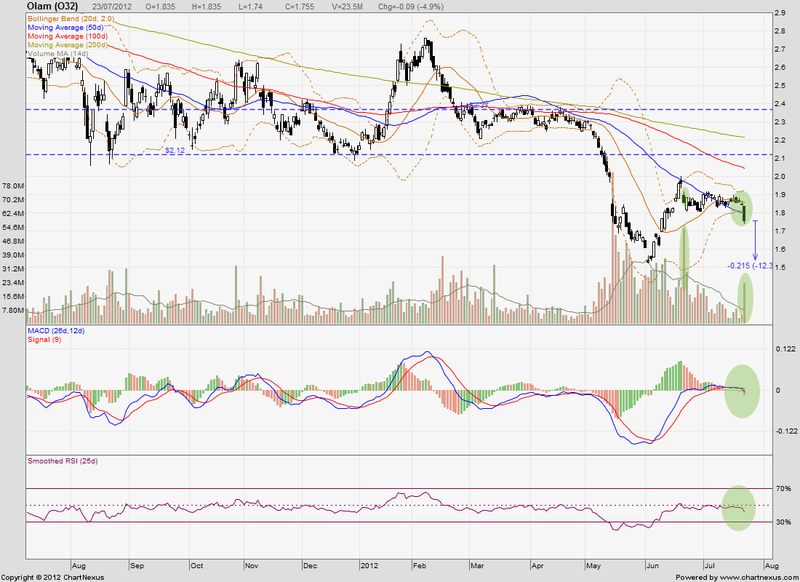 MACD - Has crossed the signal line and trended downwards with accelerating momentum. MACD is in negative territory too. RSI (25d) - Dipped below 50% and headed for the 30% level. Bollinger Bands - Bollinger bands are widening again especially along the lower band signalling even further accommodation for volatility on the downwards side. Highly likely that prices ride the lower band down further. 20d MA - Prices have crossed the 20d MA strongly, further fueling the downside selling pressure. 20d MA is also slopping downwards. Volume - Black candlestick with unusually high volume. Very bearish.